US mum LaQueena Hunter Grover thought her baby bump seemed pretty sizeable. When she met her 6.7 kg baby, she realised why. LaQueena knew she was expecting someone extra-special, and spent her pregnancy fielding curious questions about the dimensions of her burgeoning bump. “People would come up to me and say, ‘Oh I think that’s twins or even triplets. 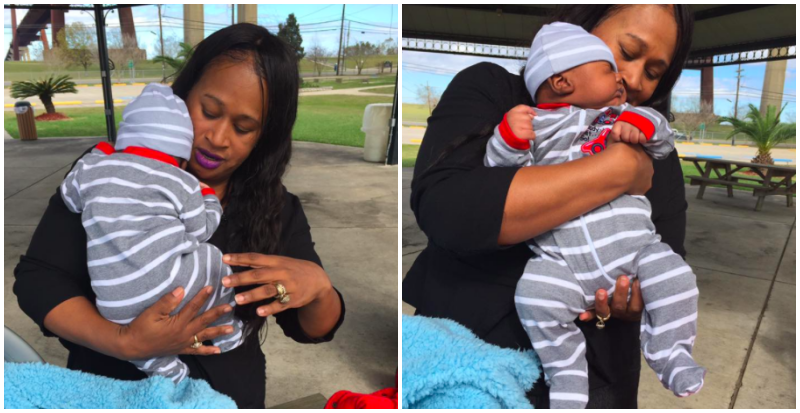 Maybe there’s another hiding behind one of the babies,'” LaQueena told WDSU News. The now mum-of-four says the birth was cause for many dropped jaws and almost Guinness Book style stats. Loyalty Adonis Grover was born on 6 December, 2016 at Tulane Lakeside Hospital in Metairie, Louisiana. It was a huge moment for everyone, in more ways than one. “Right when the doctor was taking him out, my husband’s mouth literally just dropped. He was like, ‘That’s a big baby. '” LaQueena said. LaQueena’s first two babies weighed in at a little over 7 pounds (3.17 kilograms) each, her third child bumped things up to 11.9 pounds (5.39 kilograms), so it’s perhaps not surprising that baby number four tipped the scales higher still. We’re not sure if this was a natural birth or a c-section, as the family are keeping some details private, but we are sure that this baby is very adorable and much-loved. We do know that LaQueena had some complications during her pregnancy and that her little guy spent 27 days in the NICU after his birth. He is now home getting to know his family, and doing well. Now one month old, Loyalty weighs 15 pounds (6.8 kilograms) and is 2 feet (60 centimetres) tall. He’s completely skipped the newborn stage, size-wise, his mum reveals. “He’s supposed to be in a size one as a newborn. He wears 3-to-6-month-old clothes and he wears some 6-to-9-month clothes. I put on him some shorts that were for 18-month-olds.” Woah. LaQueena says her son knows exactly what he wants, and he is very vocal about wanting it right now. “He does not like to be wet. He likes to be changed immediately. And he wants to eat as soon as he gets hungry,” LaQueena reveals. She told WDSU that her family is now complete.